Throwing a fun event is one of the best ways to raise funds for your non-profit organization or charity. Who wouldn’t want to support a great cause and enjoy a party at the same time? That’s why we believe all fundraisers should be Casino parties! People love playing Casino games, so throwing a party with this theme is a sure-fire way to get people to your event. Our professional party planning team has been helping people raise money with Casino-themed events for more than three decades, so we know what it takes. Read on to learn our top four tips for a successful fundraiser. 1. Set a specific fundraising goal. Will this event be geared toward a certain project? Are you looking to fund a particular portion of your organization’s operating expenses? When you go to plan your party, you should have a specific fundraising goal in mind. This will help you determine how much your organization can afford to spend so the event is actually profitable. In addition, setting a clear goal can shape other aspects of your party—where you have it, your guest list, how much you charge for tickets, etc. You might even choose to share your fundraising goals with attendees so you can show them how they’re helping you meet (and hopefully exceed) your targets. Of course, at your Casino fundraiser, the Casino itself cannot actually make any money (since Texas prohibits gambling), but the delightful games can (and will) bring people to your party and keep them there so they can bid up items at a silent auction or get motivated to make donations. Your marvelous fundraising plans won’t amount to much if people don’t know about your event. Good promotion is pivotal. As Joe Garecht at The Fundraising Authority notes: “Just like a new product, your event needs to be aggressively marketed to your target audience. You need to convince your supporters that your organization and event are worthy of their time and money.” Casino parties are great ways to encourage your guests to come to your fundraiser! Once you’ve decided who you want to come to your event, you can let them know about it with “your non-profit’s fundraising network, mailed invitations, direct mail, phone banks, word of mouth, and the event host committee.” In the twenty-first century of fundraising, we also recommend using social media, email, and your website to get the word out. 3. Provide multiple donation options. Purchasing tickets (you might consider offering different tiers of tickets with added bonuses for a bigger donation). Bidding at a silent auction for items local businesses donate. The Casino will keep your guests busy so that they will be able to keep on bidding! 4. Pick a fun theme. Far too often, fundraisers end up being too dry and formal. People will be more motivated to attend your event and donate money to your organization if you make it entertaining. People love playing casino games like Blackjack, Craps, and our new Deluxe Slot Machines. Having activities like these can encourage your guests to spend more time laughing, bonding, and giving to the cause. Plus, Casino decorations are easy to put up and look great! 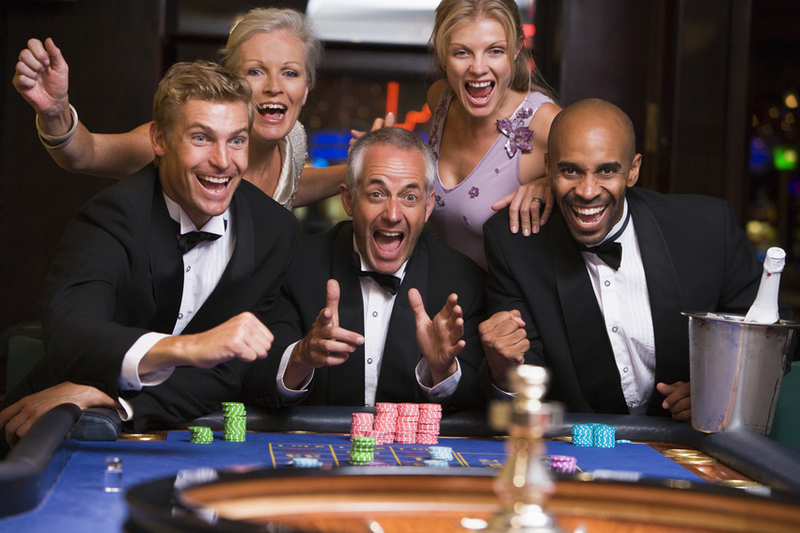 Our team can help you customize your Casino party to suit your organization’s unique personality. Are you ready to throw your charity’s Casino-themed fundraiser? Contact us today to get started planning and learn more of our seasoned team’s suggestions.